I'd like to welcome T. Michelle Nelson to the Shut Up & Read blog today! I’m not sure I ever set out to be a writer. I just enjoy writing. I don’t know if I ever thought I’d be published or have a book in print, I just wanted to make up stories. I’d still be writing even if no one wanted to read my books. I don’t have a set work schedule. I try to write every day, but if I don’t feel like it, I don’t push it. I want to be excited about what I write. I don’t want it to feel like a chore. Tell us a little bit about your MC, Lily. 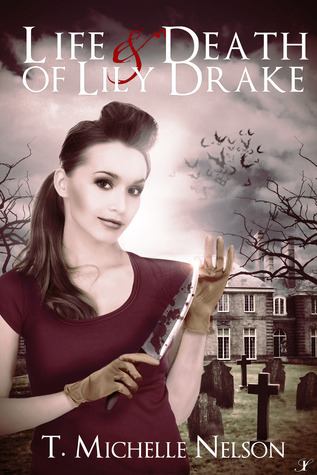 Lily is an unconventional heroine. She’s thirty-five, a single mom, a little goofy and she doesn’t always have it together. What do you feel is the hardest part of writing a book? Deciding when to stop. I like to revise and change things constantly. Every time I think I’m done, I always come up with something to do differently. What do you see as the influences on your writing? Edith Wharton is my favorite author. Her characters were always so real and somewhat flawed. I think that’s why they are so relatable. I play on a volleyball league with some great friends, and I love to go canoeing. If you could be any supernatural creature, what would you be and why? A vampire, of course! Who wouldn’t want to live forever and have all those powers? Follow this link to enter to win a copy on Goodreads! I like the humorous twist on vampires. Looking forward to eventually reading this.